He is the Lord of the Crimson Realm to whom Shana is bound. 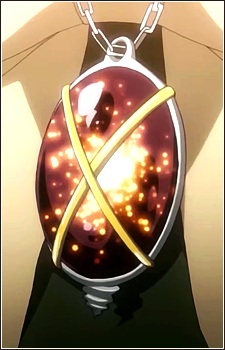 He expresses his will through a divine vessel called the Cocytus, which (in Shana's case) takes the form of a pendant. He is also a father-like figure to Shana, as he is always aiding her in her in confusion. Alastor is considered to be the strongest of all Lords or Denizens, even comparable to a god in the Crimson Realm. But even so, he tries to keep the Denizens from consuming Power of Existence. Unlike other lords that have a Flame Haze, his contractor can perform a method called Tenpa Jyousai, which requires a lot of Power of Existence and will manifest him to the world to consume all Denizens around him. This method is his Flame Haze's last resort as it will destroy the Flame Haze's body and kill the Flame Haze.